I’ve experienced a new personal record cold temperature of -28°F (Feb. 2, 2011). The previous record was-26°F set in February 1989. Fortunately, there is no wind. I guess I’m somewhat lucky in that I’ve been sick with the cold/flu and haven’t left the house in a couple of days. But, I think if given the choice, I’d rather be healthy. Today is Imbolc (aka Groundhog Day), the mid-point between the solstice and the equinox. The days are getting longer and this makes me very happy! It’s 5:00 PM and the sun is disappearing behind the pines to the west. It’s the last evening of light. By this time tomorrow it will be dark by 5:00 PM. I really wish we didn’t have to change clocks by an hour. Some lucky states like Arizona have opted out of this nonsense. I would like to opt out, but unless everyone else is with me, it doesn’t work. Believe me, I’ve tried. In spite of working this weekend, I took off a little early today to go for a quick mountain bike ride around Mud Lake. It’s the first off-road ride I’ve done since my accident last August. I’m all healed up from that. It was a gorgeous day. Winter came calling two weekends ago with four days of below freezing temperatures and wind-driven snow. But winter has already taken a respite and fall has returned. I have a hard time referring to it as fall since the leaves are long gone from the trees and the predominant color is brown. The local ski area announced it would be opening in a couple of weeks, but I have my doubts that the skiing will be any good. There is a snow storm forecast for next week. In the mean time, I’m enjoying the easier weather. The past two winters were harsh. And now I’m off to make some homemade pizza, then go back to work for the evening. Right now, with the higher than average temperatures, the snow pack is melting very fast and is causing flooding in the creeks. It has prompted the National Weather Service to issue a Flood Advisory. It’s interesting looking at the oscillations in creek flow over the course of a day. Below is a graph of the flow rate into Barker Reservoir. It peaks at about 9 PM each evening. Assuming that the peak snowmelt happens at 3PM (a wild guess based on the peak temperature), it takes 6 hours for that water to travel the various streams and reach Barker Reservoir. Further downstream, about 15 miles down Boulder Canyon, the peak flow rate is at about 1 – 3 AM each night. 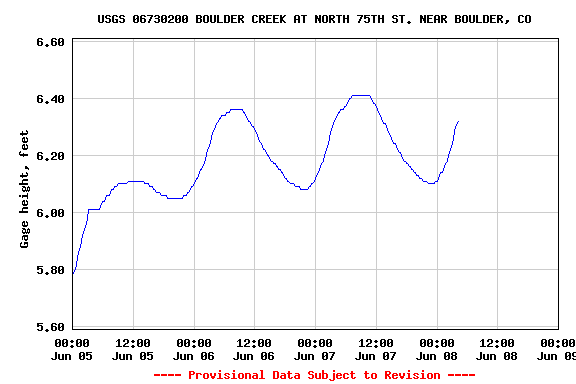 It’s a little more bumpy looking because North Boulder Creek and Middle Boulder Creek have merged and they probably have slightly different peaks. Also, normally the dam at Barker would smooth out the bumps, but since the water is spilling over the dam, it isn’t a factor. And still further downstream, east of Boulder near Walden Ponds, the peak flow rate is about 8 – 9 AM. So, from snowpack to Walden Ponds, it takes about 18 hours for the water to travel that distance. And something I learned last year when I nearly got stuck driving across a creek, the highest water level each day may not be when you think it is. The city of Boulder was built in a flood plain. If a hundred-year flood ever happens, it will likely occur in the middle of the night.